Sanders Clinic (Houston) - Book Appointment Online! 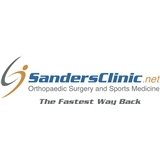 At the Sanders Clinic for Orthopaedic Surgery and Sports Medicine patients receive a comprehensive assessment and strengthening plan developed uniquely for them. A whole-body plan addressing both the nutritional and physical deficiencies ensures a stronger outcome for non-surgical, presurgical and post surgical patients alike. From trauma and joint replacements to the diabetic foot and ankle, fragility fractures, tendinitis and bunions, Dr. Sanders uses wisdom over technology to achieve the best longterm results. Patients learn how to proactively participate in the strengthening of their injured area, utilizing a whole body program designed to improve nutrition, physical strength and well being for longevity and reduced risk of recurrence. Overall, I was very impressed with Dr. Sanders. He spent ample time discussing my concerns and explaining his recommendations. Could he be warmer? Yes. However, I am looking for a great surgeon, not a new best friend.